Architecture professor Robert Trempe talked to students about his approach to work. Assistant professor of architecture at Tyler School of Art, Robert Trempe stood before a crowd of more than 60 students on March 30. Architecture professor Robert Trempe talked to students about his approach to work. Assistant professor of architecture at Tyler School of Art, Robert Trempe stood before a crowd of more than 60 students on March 30. Armed with a PowerPoint presentation, Trempe promised to reveal how to combine two seemingly opposite ideas: work and fun. 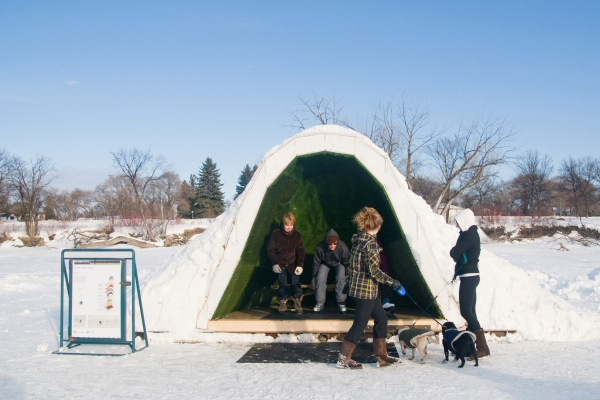 Couresy Robert Trempe Visitors try out the completed warming hut, which was installed along the Assiniboine Credit Union River Trail in Winnipeg, Manitoba. Robert Trempe, an assistant professor of architecture professor, won the annual Warming Hut Competition with his design. His presentation, “Sizes May Vary: Or How To Have Fun With Your Work,” delved into the processes behind a variety of his own architectural works, those that stand throughout the world and others that remain concepts on a computer screen. Regardless of the medium, Trempe emphasized that one of his top priorities is to have fun creating all his works – even if that means taking a couple swigs of a good beer in the process, he added with a laugh. Trempe said he loves to add aesthetic appeal wherever possible. He showed examples of colorful spreadsheets he created and information graphics that almost appear to be abstract art. “It’s taking numerical data [and] visualizing it, in what to me is an aesthetically pleasing fashion,” Trempe said. One such project was based off a questionnaire on preferred distribution of lighting in a house. Trempe gave the surveys to numerous people to record their answers across the course of several weeks. He then quantified this information and, using a special computer program, organized the data into a series of thin, overlapping lines. The lines that overlapped the most were the darkest, which represented the area indoors where the participant wanted the least amount of light. These images were not only useful as a template for the actual design of the indoor area, but visually appealing themselves. Trempe also discussed his interest in creating new meanings for old things. “There’s a beauty to disused infrastructure,” Trempe said. He got the chance to reinvent an enormous grain storage structure as part of one of the many design competitions he enters. Trempe adorned the structure with a 20-foot by 80-foot banner featuring a gradient of black dots, which gave the illusion of a thinner structure. He also described his process, from concept to construction, of his latest completed designs from the Warming Hut Competition – a small hut to provide pedestrians or ice skaters with shelter from the cold, as is often the case in its freezing location, Winnipeg, Canada. Trempe added that the most important aspect of all his projects is nothing technical but rather pure and simple fun.